Holiday season is here, the air is crisp, the days are growing shorter and the trees are lined with brilliant reds and oranges. Hands down, Thanksgiving is one of the best holidays on the calendar. There isn’t much that can compare to being surrounded by your loved ones, eating a delicious meal and watching a little football in your favorite recliner. This all sounds dreamy doesn’t it? But what if you are hosting? Sitting in the recliner with your feet propped up might seem a little out of reach if you’ve taken on the role of hosting this holiday season. Think again! 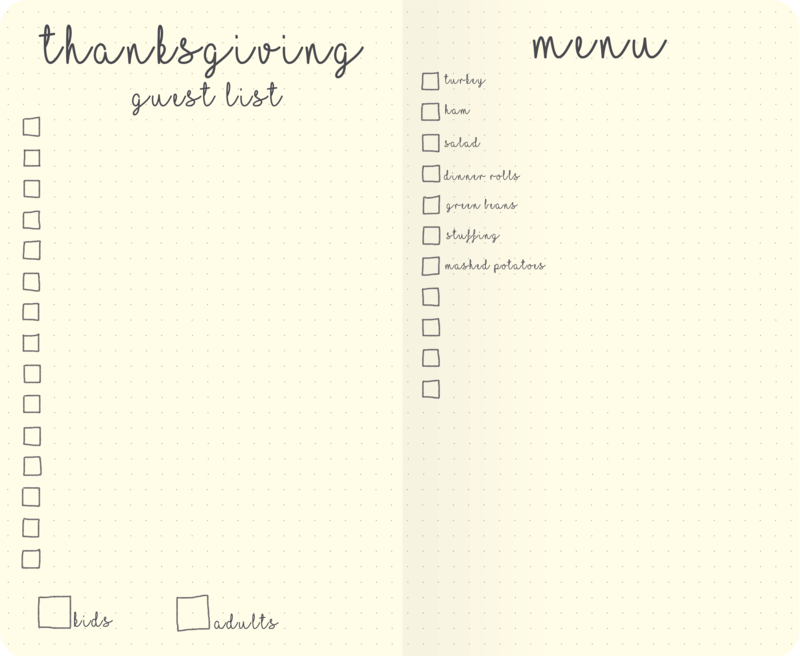 You’ve got your Dot Grid Essential Journal, the perfect place to write down your own Thanksgiving survival guide. Planning ahead is key to any successful event. Whether you’re a seasoned veteran when it comes to hosting or it’s your first time (you got this!) your Dot Grid Essential Journal will be essential in ensuring a stress-free holiday experience. Start your survival guide with the guest list. The guest list is important because this will determine what your shopping list is going to look like. Write down everyone and whether they will be bringing a guest along for dinner. For newcomers (brother’s new girlfriend?) write down a note to ask whether he or she may have food allergies; being courteous is always a great way to make a first impression. If any of your guests do have allergies, look for recipes that allow substitutions without sacrificing taste, or make sure to write labels for dishes that aren’t allergy safe. Following your guest list in your Dot Grid Essential Journal will be your shopping list. Now that you have an accurate idea of how many people will be coming to dinner you will know how much food you need to buy. Although you may want to plan for one or two unexpected extras … there’s always that one uncle that never RSVP’s or teenage nephew who’s always got to bring a buddy or two to the family events. It might be a good idea to write down a few recipes in your Dot Grid Essential Journal next to your shopping list so you don’t end up missing an essential ingredient. The last place you want to be on Thanksgiving is in the grocery store picking up a forgotten item! Make sure to add cooking times next to all of your dishes. Write down a timeline of what should be started and at what time; this cannot be stressed enough! The last thing you want is for one of your dishes to be served cold because of poor timing. Your Dot Grid Essential Journal will keep you on track and for an added reminder, set timers to let you know when you should get started on the next dish. Another noteworthy item to add to your Dot Grid Essential Journal is which dishes can be prepared in advance. Cooking a few dishes in advance (if possible without diminishing quality) can be a huge time saver. Check the dessert recipes you’ve added to your journal; typically desserts will keep just fine if made the night before. Pies can be reheated easily, and other desserts are designed to be served chilled. This point cannot be stressed enough; do not attempt to do everything on your own! Just because you are hosting doesn’t mean that the holiday should be any less enjoyable for you. Take a page in your journal to delegate a few duties to other members of your family. It doesn’t hurt to send out an email beforehand and ask for volunteers; you might be surprised that many are actually eager to help! Setting the tables, clearing dinner plates and doing the dishes after dinner are all tasks that the rest of your family should be able to help with. 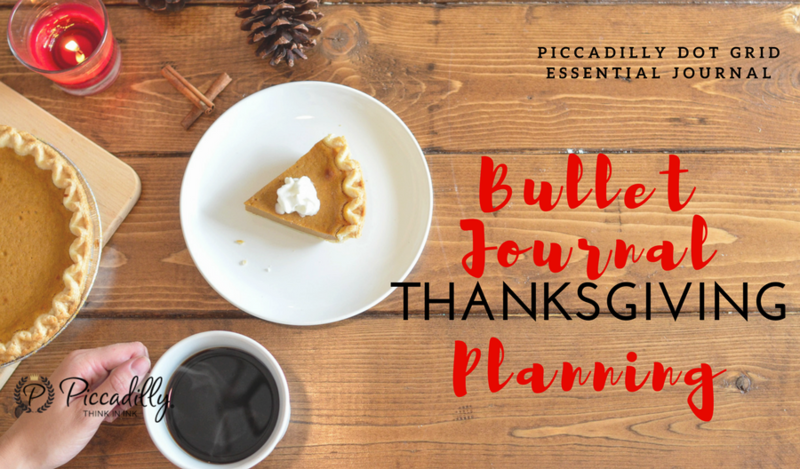 Your Dot Grid Essential Journal is now your play by play on how to make your Thanksgiving celebration a seamlessly enjoyable experience. And who knows next year’s host might want to know what your secret was on making it all happen. Happy Holidays!